A new survey shows that while early adopters of electric vehicles bought them for environmental reasons and values, the switch to electric drove them further along a sustainability journey. These findings come from this month’s survey by Flip the Fleet, a citizen science coalition of electric and plug-in hybrid vehicle owners that upload data from their vehicles to a communal database each month. Over half (59%) of the 312 respondents to the survey “strongly agreed” or “agreed” that owning an electric vehicle had spurred them to take other steps towards a more sustainable life like reducing waste, planting trees, reducing air travel and especially installing solar panels. “It’s about green chickens and green eggs” says Professor Henrik Moller, a co-founder of Flip the Fleet. “Mainly environmentalists have bought electric vehicles so far, but even these committed greenies have gone harder to reduce their environmental footprint since buying their electric vehicles”. “Once mainstream families and businesses buy electric vehicles, they also start to become more aware of other ways that they can help the environment at the same time as scoring a cheap, reliable, and really good drive”. “Installing solar panels is a natural next step once you have an electric vehicle, or a good added reason to buy one in the first place. Reducing personal air travel is a lot harder for many people.” said Professor Moller. Flip the Fleet calculates the monthly savings of greenhouse gas emissions from each family’s car, and what the equivalent of that is in terms of offsetting air travel. One respondent commented that “My wife and I blew four years of the savings in greenhouse gas emissions from owning our electric car by going to Europe for a holiday last year – that was a real wake-up call for us to reduce our air miles”. The way EV owners drive their conventional cars changes too. Survey respondents said “We now drive it slow and steady” and “When some petrol head barrels past us up the hills, we snigger. If they only knew how much they added to their fuel bill by driving like teenagers they might slow down”. Many other surveyed owners saw buying an electric vehicle very much as the end of an already well-advanced journey to become more sustainable. As one respondent put it: “It was the other way around for me. Becoming less wasteful, then installing solar, spurred me towards getting an electric car”. 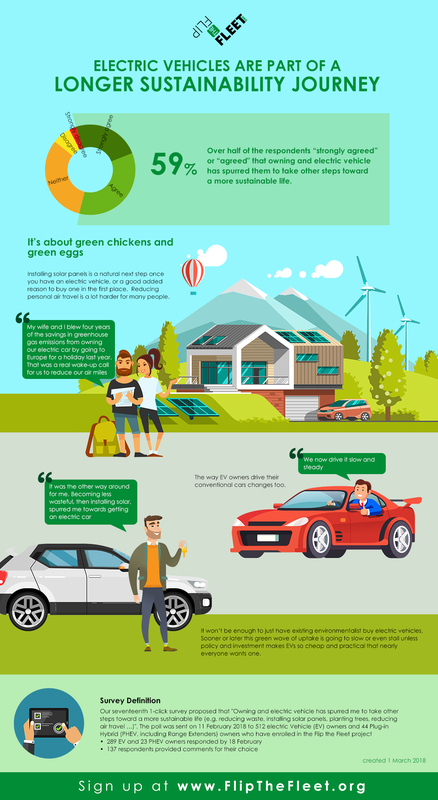 The Energy Efficiency and Conservation Authority (EECA) says the survey results are encouraging and EECA’s Energywise website https://www.energywise.govt.nz/ has lots of practical information about how people can transition to a more efficient, warmer and lower carbon lifestyle. One tool that EV owners might be particularly interested in, is the solar calculator https://www.energywise.govt.nz/tools/solar-calculator/ which works out if solar stacks up for your home. Meanwhile Professor Moller says the biggest challenge ahead for New Zealand “is to convince people to buy electric vehicles for their other benefits such as low running costs”. “We are more than doubling the number of electric vehicles and plugin hybrids in New Zealand every year. But it won’t be enough to just have existing environmentalists buy electric vehicles. Sooner or later this green wave of uptake is going to slow or even stall unless policy and investment makes EVs so cheap and practical that nearly everyone wants one. After that, the EVs will do their own magic and grow green chickens from green eggs”. Flip the Fleet is a citizen science project that provides scientifically reliable information on the benefits and constraints of electric vehicles in New Zealand. The project is partly funded by EECA, The New Zealand Government’s Energy Efficiency and Conservation Authority. The Flip the Fleet project is described at: www.flipthefleet.org. See the ‘Discussion’ and the ‘Resources’ pages there for further data and results of a recent survey of New Zealand’s electric vehicle owners about battery health. Flip the Fleet has members spread throughout New Zealand. We list the contact details of some local contributors below in case you want to get a local perspective for your story. Please ring 027 2268688 or Email wecan@flipthefleet.org so we can find a local member to speak to you.